This lovely Peruvian Hair Body Wave is a 100% Virgin Human Hair and come with a matching Closure for a gorgeous natural feel and look. This Body Wave Peruvian Hair extension is tangle-free and shed-free. Our hairs have been tested for years to be best quality hairs. 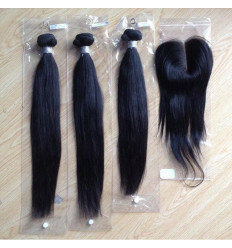 So if you desire original pure virgin hairs, get our peruvian hair. This Peruvian virgin hair extension last very long and last more than 2 years. This natural straight Peruvian Hair extensions does not pull off and does not mat. The hair gives you great value for your money. The cuticles are intact and are one direction. This Peruvian virgin hair extension is durable and last many years when properly maintained. This 100% virgin Peruvian hair is soft and smooth and will retain its natural shine and vitality. Our hair is not mixed with any synthetic fibers, last long, no shedding and no tangling.